RBA dietitians love anything and everything grilled or Pizza. So why not add them together? Try adding vegetables you wouldn't otherwise eat! Take a medium sized piece of aluminum foil and place tomatoes in the center of the foil. Drizzle with olive oil and sprinkle with salt. Fold the foil over and make a small pouch. Set aside. Drizzle olive oil over zucchini and squash and toss until lightly coated. Preheat grill to medium heat. Place foil packet and zucchini and squash on grill. Turn zucchini and squash until tender and nice grill marks appear. Tomatoes will be done when they have softened, about 10 minutes. Roll or pat pizza dough into a circle. Lightly brush olive oil on top of pizza. Place pizza, oil side down, on grill. Brush the other side with oil. Let pizza cook for about 5 minutes until puffy. Flip pizza over using tongs and spatula if needed. 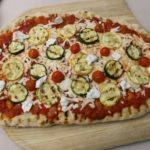 Once flipped, top the pizza with sauce, mozzarella cheese, zucchini, squash and tomatoes. Close lid to the grill and allow to cook until cheese has melted and crust is done, about another 5 minutes. Remove pizza from grill and dot with pieces of goat cheese. Serve immediately. This recipe is a remake of a pizza that a local restaurant used to make during the summer time. Feel free to use whatever vegetables you find at your farmer's market or local grocery store. The vegetables can be made ahead of time and will reheat when placed on the pizza.